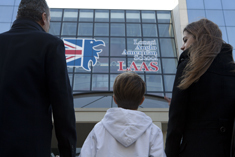 LAAS offers a welcoming educational setting and a secure learning environment for students in Kindergarten through Grade 8. Housed in an independent, modern glass structure, the school is located approximately four kilometers east of the center of Brescia, conveniently close to the ‘ring’ that accommodates the city’s hinterland. Established in 2013, the school is designed to meet the particular needs of young students at every level of the Early Years, elementary and middle school grades. LAAS’ 4,600 square meter primary school facility supports eco-friendly features that include efficient, clean and modern classrooms, study spaces, ample play areas and supporting services. Early Years – The colorful, inviting, ground-floor classrooms of the Early Years center (Kindergarten/Transition) contain sensory resources, learning stations and exploratory activities. An art room, reading area and size/age-appropriate dining area are complimented by a well-equipped indoor play hall with heated flooring. Interactive whiteboard technology opens the world in a see-touch-do environment. Elementary – On the first and second floors, elementary classrooms are contemporary and suited to support busy, active learners. All classrooms within the primary school feature interactive whiteboards, with tablet technology for students in Grades 4 and above. A music conservatory, art studio, science laboratory and classrooms for Italian/Latin and Mandarin Chinese are incorporated into the upper floors. Throughout, spacious windows allow natural light to permeate the interior, welcoming nature indoors. Modern LED solid-state lighting and central heating and air bring added comfort, while a full-service elevator makes accessible to the disabled all areas of the building. An extension of approximately 2,300 square meters articulates space, light, glass and wood in a 21st-century environment. Studio-sized classrooms of comfortable, open-floor planning feature transparent inner and exterior walls that display sound-proofed working environments around an interior agora-styled court. Robotics and science labs, a newsroom and indoor gymnasium highlight student interests. Exterior space allows learning to flow out of doors onto an ample patio and enclosed green park.